World Cup 2014: Prime Time for Brazilian Wine? Faces, the official World Cup Brazilian wine. Click on the image to view a FIFA video about the wine. The World Cup — FIFA’s celebration of global soccer — kicks off on Thursday in São Paulo with host Brazil vs Croatia and will end on July 13 in Rio with the final match at the famous Maracanã stadium, which was originally constructed for the first Post-WWII World Cup in 1950. That game is likely to be the most-watched single event in world history — talk about prime time! Soccer is a fast game full of twists and turns and it is notoriously difficult to predict how a big tournament like this will end, but based on history, which I admit does not always repeat itself, I will hazard three observations. First, the winner is likely to be from the western hemisphere, not Europe, Asia , Oceania or Africa. Only twice has a team from outside the host country’s half of the globe won the big prize: Brazil in Sweden in 1958 and Brazil in South Korea-Japan in 2002. Good news for Brazil, Argentina, Uruguay, Columbia, Mexico, the USA and the other teams from that part of the world. Second, the winner is likely to be Brazil based on the fact that they have won more World Cups (5) than Italy (4) or Germany (3). Among Western Hemisphere powers Argentina and Uruguay have won two each. That Brazil is also the host country improves its odds, according to my soccer-mad friends, although it is important to remember they lost the final at home to Uruguay in 1950 — a result that made young Pelé’s father cry and inspired the later successful efforts. Finally, the 2014 World Cup champion is likely to be a significant wine country. Every previous winner of the Cup from Uruguay in 1932 to Spain 2010 plays in the world wine league, even 1966 winner England, which makes up for its modest but growing current wine product by being a key export market for the world’s wine. Is that too much of a stretch? I hope not — otherwise the Netherlands, another big export market, might as well give up now! Is Brazil an important wine country? If so, then it would seem to be the strongest possible favorite to win the cup, as a report from the analysts at Goldman Sachs suggests. Wine is alive and well in Brazil. No wonder they are using the occasion of the World Cup to promote their industry (click on the image above to see a FIFA video) much as South Africa did (see video below) when they hosted the 2010 tournament. Brazil’s total wine output does not rival France, Italy and Spain, the globe’s top producers (and World Cup winners, too) but they are not at the bottom of the league table, either. Data for 2009 put Brazil’s wine production at 340 ML, less than Argentina (1214 ML) or Greece (425) but ahead of Austria (235 ML), New Zealand (205 ML), Uruguay (62 ML) and Croatia (75 ML). Huge Brazil is not covered with vines, but it is clear that enough of it is to make it a significant wine producer. My friends in Portugal and Argentina see Brazil as a significant export market, too, based on various combinations of language, history, culture and proximity that facilitate sales of their wine. And they are not alone is seeing Brazil’s potential. OIV data for 2013 put Brazil’s total wine consumption at 348 ML, above Chile but less than South Africa. Champagne-maker Möet & Chandon saw Brazil’s potential, especially for sparklers, as far back as 1973, when it was making its big globalization push into the U.S., Australia and Argentina. They invested in sparkling wine production in Brazil figuring that if anyone was going to sell domestic “Champagne” to fizz happy Brazilians it should be the Champenoise themselves. Möet & Chandon were soon joined by other wine/drinks multinationals including Seagrams, Bacardi, Heublein, Domecq and Martini & Rossi, so the international presence in Brazil is quite strong. I haven’t tasted Faces, the official Brazilian wine of the 2014 World Cup, which is made by Lidio Carraro Boutique Winery, but I like its style. The wine brand picks up the twin themes of unity and diversity that are important to a sports team and so very important in Brazil’s history. Many Faces, One Heart — it is a fine message, don’t you think? The white wine is a blend of Chardonnay, Muscat and Riesling Italico, which should be a pleasant summer sipper. The red wine spares no effort to make the soccer connection — it is a blend of eleven different red grape varieties, one for each of the players on a soccer team. Eleven players. Eleven grape varieties. In the same manner as the Brazilian national football team, the FACES wine label will represent Brazil as the OFFICIAL LICENSED WINE OF 2014 FIFA WORLD CUP™, reflecting the national terroir with a team of grapes from different grape-growing regions, representing colors, aromas and flavors of our territory. Merlot, Cabernet Sauvignon, Teroldego, Touriga Nacional, Tannat, Ancellotta, Nebbiolo, Tempranillo, Pinot Noir, Malbec and Alicante Bouschet are the selected grape varieties for the FACES red wine range. These varieties hail from every corner of the Serra Gaucha, including the Vale dos Vinhedos – the most traditional area for grape growing and wine-making in Brazil and also other locations in the Southern part of Rio Grande do Sul state. 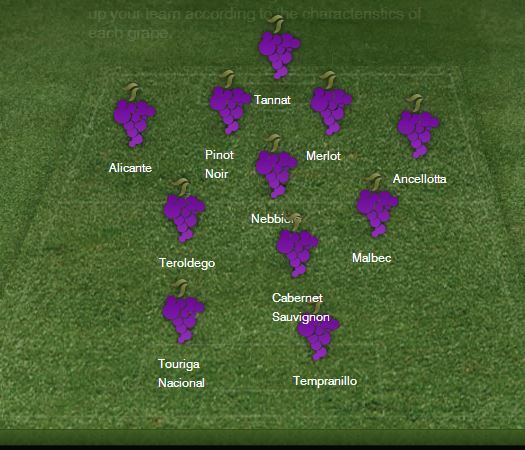 If you scroll down on the Faces website you can find an interactive element that allows you to fill each position on the team from goalkeeper to striker with your choice of the appropriate grape variety. Apparently I am not a very good wine/soccer manager. I put Tannat in goal, but the winery says that Malbec is better there. But I did better with my choices at forward, according to the website. Some parts of this column appeared in my previous survey of wine in the BRIC nations. 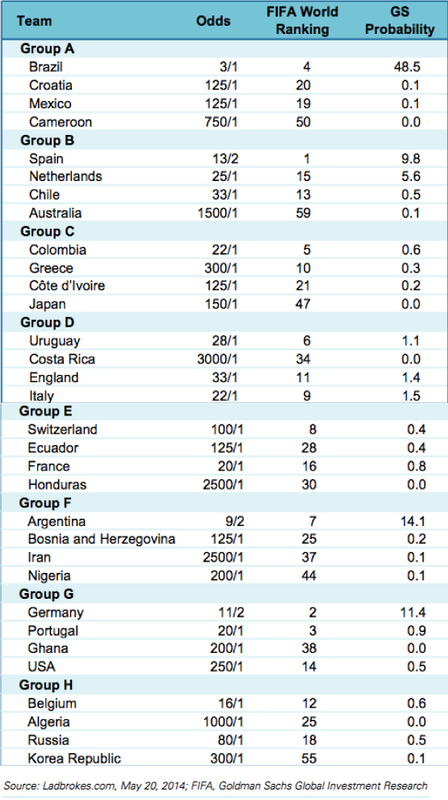 Here is the Goldman Sachs odds sheet for the World Cup as reported in the Wall Street Journal. GS calculates that Brazil has a 48.5 chance of winning its 6th World Cup.